John Andreas Widtsoe (/ˈwɪtsoʊ/; 31 January 1872 – 29 November 1952) was a member of the Quorum of the Twelve Apostles of The Church of Jesus Christ of Latter-day Saints (LDS Church) from 1921 until his death. Widtsoe was also a noted author, scientist, and academic. Widtsoe was born on the island of Frøya in Sør-Trøndelag, Norway. At birth his hand was attached to the side of his head, but he had an operation to correct this problem. When Widtsoe was two, his family moved to the Norwegian mainland city of Namsos. His father, also named John, died in February 1878. This left his mother, Anna, as a widow with two young sons to take care of: Widtsoe, who was then five, and his younger brother Osborne Widtsoe. The family moved to Trondheim, where they were introduced to the LDS Church by a shoemaker. In 1883, Widtsoe immigrated to the United States with his mother and brother. They arrived in Utah Territory in mid-November. Widtsoe was baptized a member of the LDS Church the following April. Widtsoe graduated from Brigham Young College in Logan, Utah. He then attended Harvard University, graduating with honors in 1894. In 1898, Widtsoe was ordained to the office of seventy and set apart to do missionary work in connection with his studies in Europe. He entered the University of Göttingen, Germany, and graduated with the degrees of A.M. and Ph.D. in 1899. For part of his time in Europe, Widtsoe lived in Switzerland. The police wanted proof that he and his wife were married, and since they had neglected to bring their American wedding certificate with them, they were married a second time. In August 1900, Widtsoe became the director of the Agricultural Experiment Station at Utah State Agricultural College. While in this position, he founded The Deseret Farmer with Lewis A. Merrill and J. Edward Taylor. Their goal was to have it be a popular magazine that would be read and implemented by farmers. In 1905, Widtsoe was dismissed from the agricultural college as a result of political debates about its future and feelings of William Jasper Kerr, the university's president, that Widtsoe was insufficiently supporting him. For a short time, Widtsoe was a professor of agriculture at Brigham Young University (BYU), and is arguably the founding father of BYU's college of biology and agriculture. (Previously on the BYU campus, the John A. Widtsoe Building was the home of the College of Biology and Agriculture. A new building, the Life Sciences Building, took its place in 2014). Soon, however, he returned to Logan and succeeded Kerr as president of Utah State Agricultural College; he served in this position from 1907 to 1916. He also served as the president of the University of Utah from 1916 until his call as a member of the LDS Church's Quorum of the Twelve in 1921. Widtsoe was the fifth Commissioner of Church Education from 1921 to 1924 and was the seventh commissioner from 1934 to 1936. During his time as an apostle, Widtsoe taught a religion class at the University of Southern California. For two years in the 1920s, Widtsoe lived in Washington, D.C., where he supervised the reorganization of the Federal Bureau of Reclamation. Widtsoe was closely associated with the Improvement Era even before he became an apostle. He was associate editor of the magazine from 1935 until 1952. As editor of the Improvement Era, Widtsoe "directed its growth from a magazine primarily for the youth to the voice of the whole Church". One of Widtsoe's employees while at the magazine was Hugh Nibley, who Widtsoe convinced to become a professor at BYU. Widtsoe was also a member of the church's Genealogy Committee, being one of the main people behind the implementation of the Temple Index Bureau. In 1923, Widtsoe accompanied fellow apostle, Reed Smoot, on a journey to Great Britain and the Scandinavian countries, during which they secured recognition and opened the way for missionaries of the church to return to these lands. From 1926 until 1932, Widtsoe served as president of the European Mission. While in this office, he convinced the First Presidency to call a separate president of the British Mission, so that the president of the European Mission could focus on supervising the missions in continental Europe. While president of the European Mission, Widtsoe dedicated Czechoslovakia for the preaching of the gospel, and worked closely with Arthur Gaeth in starting the mission there. Widtsoe married Leah Dunford, a daughter of Susa Young Gates, who was a daughter of LDS Church church president Brigham Young. Their first child, Ann Gaarden Widtsoe, was born in Germany. The couple went on to have eight children, but only three lived to adulthood. Widtsoe worked closely with his wife and mother-in-law to write a biography about Young. Widtsoe also edited a book containing significant teachings of Young. Widtsoe was also the lead compiler of Gospel Doctrine, a collection of sermons and teachings of LDS Church president Joseph F. Smith. Widtsoe and his wife authored The Word of Wisdom: A Modern Interpretation, a book which advocates the incorporation of healthy eating habits into the Word of Wisdom. Widtsoe wrote A Rational Theology as Taught by the Church of Jesus Christ of Latter-day Saints, which has been cited by later LDS authors such as J. Reuben Clark. He also wrote Evidences and Reconciliations, which was a compilation of his Improvement Era writings, answering common questions on matters of faith. In this work, Widtsoe acknowledges that there are multiple interpretations that Latter-day Saints can hold on certain issues. One example is his explanation of the time involved in the creation of the earth: he indicated that faithful Latter-day Saints could hold the "six-day", "six-thousand-years", or the "undefined-period" interpretations of the creation. Although Widtsoe focused on explaining the rationale for the "undefined-period" interpretation, he did not belittle the other two or state that they were unorthodox. In 1939, Widtsoe published Priesthood and Church Welfare and Priesthood and Church Government. His work, The Message of the Doctrine and Covenants, was published after his death, after having been edited by his son-in-law, G. Homer Durham. Widtsoe wrote Seven Claims of the Book of Mormon: A Collection of Evidences with Franklin S. Harris, Jr.
Widtsoe wrote a biography of Joseph Smith entitled Joseph Smith: Seeker After Truth Prophet of God. It was published in 1951, and later reprinted by Bookcraft in 1957. Widtsoe also wrote Joseph Smith as Scientist: A Contribution to Mormon Philosophy, published by the Young Men's Mutual Improvement Association in 1908. In 1944, his essay, "The Divine Mission of Joseph Smith", was included in Handbook of the Restoration published by Zion's Printing and Publishing Company in Independence, Missouri. Non-religious books by Widtsoe include Dry-Farming: A System of Agriculture for Countries Under a Low Rainfall (New York: MacMillan, 1920) and Dodge's Geography of Utah. Widtsoe wrote two autobiographies. The first, In the Gospel Net, largely focused on his mother's conversion to the LDS Church. The second, In a Sunlit Land, told the story of his later life, and also included explanations of his educational philosophy. Widtsoe wrote the hymn "How Long, O Lord Most Holy and True", which appears as hymn number 126 in the current LDS hymnal. Grave marker of John A. Widtsoe. Widtsoe died in Salt Lake City, Utah, of uremia; he also had prostate cancer for a number of years before his death. He was buried at Salt Lake City Cemetery. Adam S. Bennion was called to fill the vacancy in the Quorum of the Twelve following Widtsoe's death. Widtsoe, John A. (1906). A Concordance to the Book of Doctrine and Covenants of the Church of Jesus Christ of Latter-day Saints. Salt Lake City, Utah: Deseret Sunday School Union. —— (1908). Joseph Smith as Scientist: A Contribution to Mormon Philosophy. Salt Lake City, Utah: General Boards Young Men's Mutual Improvement Associations. ——; William Peterson (1908). Dodge's Geography of Utah. Chicago: Rand, McNally & Company. —— (1911). Dry-Farming: A System of Agriculture for Countries Under a Low Rainfall. New York: Macmillan. —— (1914). The Principles of Irrigation Practice. New York: Macmillan. —— (1915). Rational Theology: As Taught by the Church of Jesus Christ of Latter-day Saints. Salt Lake City, Utah: General Priesthood Committee of the Church of Jesus Christ of Latter-day Saints. —— (1918). Western Agriculture. St. Paul, Minn.: Webb Publishing Co.
——; Joseph F. Smith (1919). Gospel Doctrine. Salt Lake City, Utah: Deseret News. —— (1925). Discourses of Brigham Young. Salt Lake City, Utah: Deseret Book Co.
—— (1928). Success on Irrigation Projects. New York: John Wiley & Sons, Inc.
—— (1930). In Search of Truth: Comments on the Gospel and Modern Thought. Salt Lake City, Utah: Deseret Book. ——; Franklin S. Harris (1935). Seven Claims of the Book of Mormon: A Collection of Evidences. Independence, Missouri: Zion's Printing and Publishing Co.
—— (1936). Program of the Church of Jesus Christ of Latter-day Saints. Salt Lake City, Utah: Department of Education of the Church of Jesus Christ of Latter-day Saints. ——; Leah D. Widtsoe (1937). The Word of Wisdom: A Modern Interpretation. Salt Lake City, Utah: Deseret Book. —— (1939). Priesthood and Church Government in the Church of Jesus Christ of Latter-day Saints. Salt Lake City, Utah: Deseret Book. —— (1939). Current Gospel Questions. Salt Lake City, Utah: General Boards of the Mutual Improvement Associations. —— (1941). In the Gospel Net: The Story of Anna Karine Gaarden Widtsoe. Independence, Missouri: Zion's Printing and Publishing Co.
—— (1943). Your Questions Answered. Salt Lake City, Utah: General Boards of the Mutual Improvement Associations. —— (1943). Evidences and Reconciliations: Aids to Faith in a Modern Day. Salt Lake City, Utah: Bookcraft. —— (1945). Man and the Dragon and Other Essays. Salt Lake City, Utah: Bookcraft. —— (1947). Gospel Interpretations: More Evidences and Reconciliations. Salt Lake City, Utah: Bookcraft. —— (1947). How the Desert was Tamed; A Lesson for Today and Tomorrow. Salt Lake City, Utah: Deseret Book. —— (1949). The Articles of Faith in Everyday Life. Salt Lake City, Utah: Young Men's and Young Women's Mutual Improvement Associations. —— (1951). Joseph Smith: Seeker After Truth, Prophet of God. Salt Lake City, Utah: Bookcraft. —— (1952). In a Sunlit Land: The Autobiography of John A. Widtsoe. Salt Lake City, Utah: Deseret News Press. ——; G. Homer Durham (1969). The Message of the Doctrine and Covenants. Salt Lake City, Utah: Bookcraft. Skanchy, Anthon L. (1915). ——, ed. Anthon L. Skanchy: A Brief Autobiographical Sketch. Salt Lake City, Utah. ^ Lawrence Cummins, “John A. Widtsoe—Master Teacher,” Friend, May 1990, p. 48. ^ Parrish, Alan K. John A. Widtsoe: A Biography. (Salt Lake City, Utah: Deseret Book, 2003) p. 17. ^ Parrish. Widtsoe. pp. 20–23. ^ Parrish. Widtsoe. p. 28. ^ Parrish. Widtsoe. p. 38. ^ Durham, G. Homer. "Foreword" to Widtsoe, John A. The Message of the Doctrine and Covenants. (Salt Lake City, Utah: Bookcraft, 1969) p. v.
^ Widtsoe, John A. "In A Sunlight Land". ^ Parrish. Widtsoe. p. 121. ^ Parrish. Widtsoe. p. 547. ^ Parrish. Widtsoe. p. 135. ^ Parrish. Widtsoe. p. 535–45. ^ a b c d Parrish, Alan K. "John A. Widtsoe" in Garr, Arnold K, Donald Q. Cannon and Richard O. Cowan, ed. Encyclopedia of Latter-day Saint History (Salt Lake City, Utah: Deseret Book, 2000) p. 1343. ^ Parrish. Widtsoe, p. 548. ^ Peterson, Boyd. Hugh Nibley: A Consecrated Life. (Salt Lake City, Utah: Greg Kofford Books, 2002). ^ Allen, James B., Jessie L. Embry and Kahlile B. Mehr. Hearts Turned to the Fathers: A History of the Genealogical Society of Utah, 1894-1994 (Provo, Utah: BYU Studies, 1995) p. 98. ^ Finding aid author: Ann Hinckley (1976). "The Widtsoe Family Papers, 1866-1966". Prepared for the Utah State Historical Society, Salt Lake City, UT. Retrieved May 4, 2016. ^ Clark, J. Reuben. Behold the Lamb of God. (Salt Lake City, Utah: Deseret Book Company, 1962). ^ See Evans, Richard L. "Introduction" to Widtsoe, John A. (arranged by G. Homer Durham) Evidences and Reconciliations. (Salt Lake City< utah: Bookcraft, 1960). 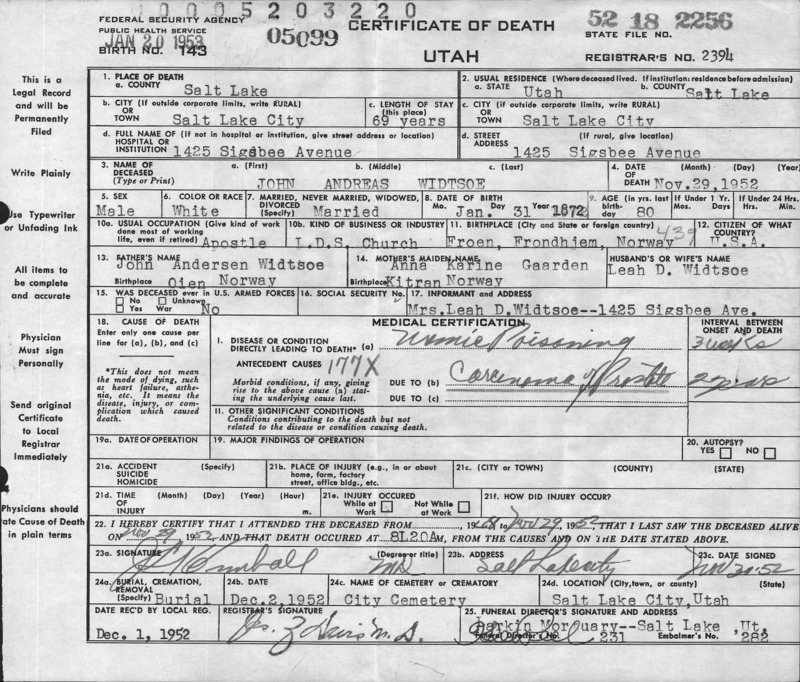 ^ State of Utah Death Certificate Archived 2011-08-18 at the Wayback Machine. This page was last edited on 6 January 2019, at 03:53 (UTC).